Liberty House  perhaps one of Hawaii's largest local retailers  is where Jen got a job (three times), first in October 2000. On a whim, after more than two years of stay-at-home parenthood, Jen decided to apply at the Ala Moana store, and they hired her on the spot. Of course, we didn't have any daycare arrangements for Katie, so she had to go back and tell them she couldn't take the job. Soon afterward, however, a spot opened up for Katie at Montessori Community School, so we enrolled her and Jen went back to Liberty House to reapply. And they were happy to offer her another position. Unfortunately, Jen was only a part-time floater (assigned to different departments as needed, for only 20-30 hours a week), and Montessori turned out to be very expensive. So when 2001 rolled around, two months after starting there, Jen became a full-time mom again, and switched to only working weekends. Then, a couple of months later, Katie got into the more affordable and accomodating Kama`aina Kids program, and Jen went back and got hired for the third time. She's now a sales associate in the cookware department. Liberty House  which had seven O`ahu locations, at Ala Moana, Kahala Mall, Pearlridge, Windward Mall, Waikiki, Kailua, and downtown (as well as a handful on the neighbor islands and in the South Pacific)  made occasional headlines, as it was technically bankrupt and battling with both creditors as well as various administrative boards. Known for generally pricier fare (from clothes to housewares to cosmetics and the like) business had been weak in recent years. The arrival of large national retail chains, from WalMart to Neiman Marcus, hadn't helped. It eventually emerged from bankruptcy, and a few months later (in June 2001), Federated Department Stores announced that it would buy out Liberty House and turn them into Macy's stores. The conversion spanned several weeks, and over Thanksgiving, Liberty House entered the annals of history, and Macy's debuted in the islands. © 1999 Marketplace Hawaii/CyberCom, Inc.
September 26, Captain Heinrich Hackfeld, out of Bremen, Germany, arrives in Honolulu with $8,400 of merchandise. With him are his wife, Marie, her 16 year-old brother, J.C. Pflueger, and a nephew, B.F. Ehlers. October 1, Hackfeld's Dry Goods opens on Queen Street and is an immediate success. Merchandise for sale includes cloth goods, parasols, bird cages, steel pens, boots, stationery, iron bedsteads, lead pencils, looking glasses, shovels and tarpaulins. Land is purchased on Fort Street, at a cost of $2,185.40, and a two-story building erected. The store at the new Fort Street site is affectionately called "Hale Kilikia" (House of Silk), because of its extensive collection of pineapple silks. The store is re-named B.F. Ehlers, for the new manager/owner (who was also Heinrich Hackfeld's nephew). The first commercial Christmas trees are displayed to the delight of Hawaii's keiki. The Islands' first commercial full-length plate glass mirrors are installed and heralded as a shopping innovation by fascinated customers. Heinrich Hackfeld becomes a charter member of Honolulu's Chamber of Commerce. The Fort Street store is destroyed by fire, but from its ashes a new two-floor store is built just in time for holiday shopping. B.F. Ehlers & Co. celebrates its 50th anniversary with: A reception attended by the President of the Republic of Hawaii, Sanford B. Dole; Donations of $1,000, each, to over a dozen community charities; Erection of a wrought-iron gate at the beginning of Fort Street bearing the original lettering, "H H & Co Ltd."
Special Sales at B.F. Ehlers & Co.: muslin underwear, 1 garment for 80 cents; one dozen Turkish towels, $2.25; silk fabric from taffetas at 25 cents/yard to dainty patterned pompadour silks at 85 cents/yard. In response to a wave of World War I patriotism the store is renamed "The Liberty House" to clarify its American ownership. The new name is selected in a contest, with winner receiving a $50 prize. A third floor is added to The Liberty House Fort Street store. Total cost of the project: $143,000. May's Market a leading retail grocer, is acquired and renamed Liberty House May's Market. It offers telephone order service, charge accounts and home deliveries. The market remains opens into the 1940s. A company magazine called "Ka Hale Kokua" (The House of Friendliness and Service) is created to share news about The Liberty House among staff as well as with customers from around the world. The six-page publication includes editorial by the store manager, details of store activities, fashion notes, and current events. Distribution: 2,000 copies. The Liberty House Fort Street store expands to an annex building. Children are so important to The Liberty House that nearly an entire floor of the new annex is devoted to infants' clothing. A trained nurse is on staff, and during Baby Week, the first week in June, customers bring their babies in for a free examination. An estimated 1 million people a year pass through Liberty House doors. 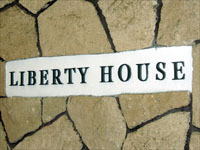 The Liberty House employs 240 people. By 1999, the staff numbers more than 3,000. The Tea Room opens in November, serving luncheon and tea with a soda fountain dispensing cool drinks to shoppers at its King Street annex. The Liberty House publishes "The Liberty House Cook Book and Kitchen Guide for the Busy Woman." Cost of this hardcover, 416-page book: 63 cents. Besides recipes and menus, the book provides advice on furnishing a kitchen ("A Workshop of Color and Charm"), care and use of the "mechanical ice box," and suggestions for an emergency shelf, stocked with preparations for "the inevitable domestic crisis of unexpected company." The Junior League of Honolulu holds "Dollar Day" fundraisers at The Liberty House, with League members selling items for $1 in the store. A percentage of the day's proceeds benefited the League's Community Trust Fund. The Liberty House opens its second store in fast-growing Waikiki, recognizing the growing importance of this area as a gathering place for fashion-conscious people. Style shows are presented at McKinley, Roosevelt and Farrington high schools to "encourage dressmaking by young girls and homemaking in general." The Liberty House is the first island retailer to be named as an issuing agent for war bonds by the U.S. Treasury. During World War II, importation of Christmas trees is prohibited so The Liberty House offers a novel substitute: a 6-ft. wooden pole painted dark green with pre-drilled holes in which customers could place fresh greens and branches. Cost of the pole: $4.00. Women's Fashion designers: Eisenberg Originals, Hattie Carnegie, Adele Simpson, William Bass, McMullen Classics, Maurice Reutner. Men's Shop designers: Knox, Excello, Louis Roth, Tropi-Tex, Nettieton, Hollywood Rogue. Cosmetics and toiletries: Frances Denney, Alexandra de Markoff, Mary Chess, Elizabeth Arden, Lentheric, Lucien Lelong. Footwear makers: Palter Deliso, Vitality, Urbanites, DeLiso Debs, Joyce. Lingerie brands: Barbizon,Love-E, Yolande, Maiden-Form, Seam-Prufe, Bien Jolie, Vassar, Gossard. A Kailua store opens in November to serve the residents of Kailua and Lanikai. Employees at this location number three, and selling space comprises 1,200 sq. ft. The Liberty House takes ownership of the Waikiki Drug Company on Kalakaua Avenue, later know as the Waikiki Pharmacy, a sundry and drug store with soda fountain. Cost of a club breakfast in 1950: 80 cents for eggs, bacon, hash browns and toast. Store hours at The Liberty House Fort Street are 8:25 am-4:55 pm. Exactly. The Liberty House celebrates its 100 year anniversary. The Liberty House on Fort Street premiers the Fuller Paint Shop, complete with decorating consultant, for "lasting color and beauty for your home." The Easter Bunny is brought to the Islands in style aboard the Matson Line, Lurline. He hops down the gangplank to be greeted by the The Liberty House Downtown store manager, with a bouquet of carrots, and the St. Louis College band. The Easter Bunny takes up residence at Bunnyland, in the toy department, for a week. The Waikiki store undergoes a major expansion and renovation, and its new style is called " Hawaiian Modern"; the plum-colored building has chartreuse accents, and tile and teakwood details. Downtown customers take their first ride on the store's new electric stairways, installed just in time for its Birthday Sale. In a few months, store-wide air conditioning will follow. The Kailua shop is upgraded to a department store with full lines of all merchandise, nearly 50 employees, and a sales floor of 28,000 sq. ft. It even includes a Hardware and Hobby shop for "the men who like to putter." 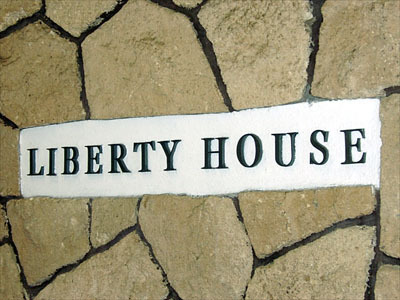 "The" is dropped from its name, and the company becomes simply, Liberty House. Liberty House takes top honors in the Aloha Week Parade with its "Seascape in Orchids" float, made with 50,000 orchids assembled by the Honolulu Orchid Society. The first Zooper Sale is held. Newspaper ads ask, "What is a zooper?" with sketches of fanciful imaginary creatures. Today, the Zooper Sale identity is clear as the company's biggest sale of the year. The Kahala store opens (at the time known as the Waialae store). It features 80-foot high rooftop revolving beacon whose blue light is visible for miles at night. Hailed as "Honolulu's most beautiful suburban store, its interior features a hanging staircase with teak railings and Italian mosaic tile. First Hibiscus Award given to the person or persons making the most outstanding contribution to the local Polynesian apparel industry. This annual award is presented at a fashion show, featuring music of the islands. Liberty House's flagship store opens at the brand new Ala Moana Shopping Center, which replaces Downtown as O'ahu's major shopping area. Liberty House "brings the world to the islands" with annual storewide festivals, celebrating the culture, fashion, food and music of: France (twice), Portugal, Great Britain, Italy (twice), Philippines, California and New York. As O'ahu's population grows toward the Central and 'Ewa regions, so does Liberty House. It is the very first store to open at the brand new Pearlridge Center. The focal point of the store is a pair of Plexiglas "fashion capsules" that move up and down in the two-story escalator well, featuring two mannequins in each capsule. At the grand opening, the first 2,000 customers receive Pink Pearl flowering plants as a souvenir. The first neighbor island store opens at Kaahumanu Shopping Center on Maui. Liberty House renews its presence in Kailua-Kona with the opening of a store in the Hotel King Kamehameha. The Ala Moana store reaches new heights with the addition of a fourth floor, devoted entirely to Home furnishings. Liberty House opens in Kaneohe as one of the anchors of the Windward Mall, which rose up in place of fields of buffalo grass, rows of quonset homes and small farms. Simultaneously, Liberty House opens at Kukui Grove to serve our many Kauai customers. In November, Hurricane Iwa causes severe damage to the island and the new store. The Hilo store opens at the Prince Kuhio Plaza. Reverend Henry Kahelihili gives the blessing for the Big Island's first major department store. Shoppers come from as far as Kona to join in the opening festivities. Liberty House and the American Heart Association begins a special partnership that continues today. For the annual Heart Ball, Liberty House visual merchandising and advertising departments create and install the festive ballroom decor as well as produce the invitation, program, silent auction catalog and promotional brochure. In 1997, the 20th anniversary of the Heart Ball, Liberty House is honored as a Heart Angel for continued support of this spectacular social event which benefits the AHA, Hawaii Affiliate's research, education and community service programs. Hurricane Iniki strikes Kauai, causing major damage to the Kukui Grove store's roof. Reopening within a week, the store and its employees help the community and neighbors. In the days after Iniki, the hot and sticky post-hurricane weather combines with the lack of air conditioning to give the beauty salon a "cool" idea: a sidewalk sale on haircuts! They set up chairs outside the store and people come in droves. Liberty House expands to Guam, opening a store at Micronesia Mall to serve our Pacific island neighbors. Liberty House Makalapua opens as the company's 10th department store in Hawaii. The opening night gala, a fundraiser for Family Support Services of West Hawaii, is an evening of fashion, gourmet food and music by the Brothers Cazimero. Liberty House celebrates 150 Years of Aloha with a year of activities and events. Premier island chef Alan Wong and Liberty House Ala Moana collaborates with exciting new ventures, to be completed by the end of the year: Alan Wong's at Liberty House, our feature restaurant with exhibition kitchen on the third floor; a cafe/coffee bar on the second floor; a beverage bar and patisserie on the third floor; and on the fourth floor, a Hawaii Regional Cuisine Marketplace.